€100 Welcome Bonus with easy conditions. Tax Free for German customers. Tipico is an international operator of sports betting and casino games. The company is running an online sportsbook and more than 750 sports betting offices, mainly in the German-speaking parts of Europe. The brand was founded in 2004 and their headquarters are based in St. Julian’s in Malta. Tipico has already gathered a huge customer base during a short time span, especially in Germany. By signing various sponsorship deals with Bundesliga clubs like FC Bayern München, Hamburger Sportverein, SV Werder Bremen, FC Freiburg, TSG 1899 Hoffenheim, and RB Leipzig, the brand has gained high popularity. 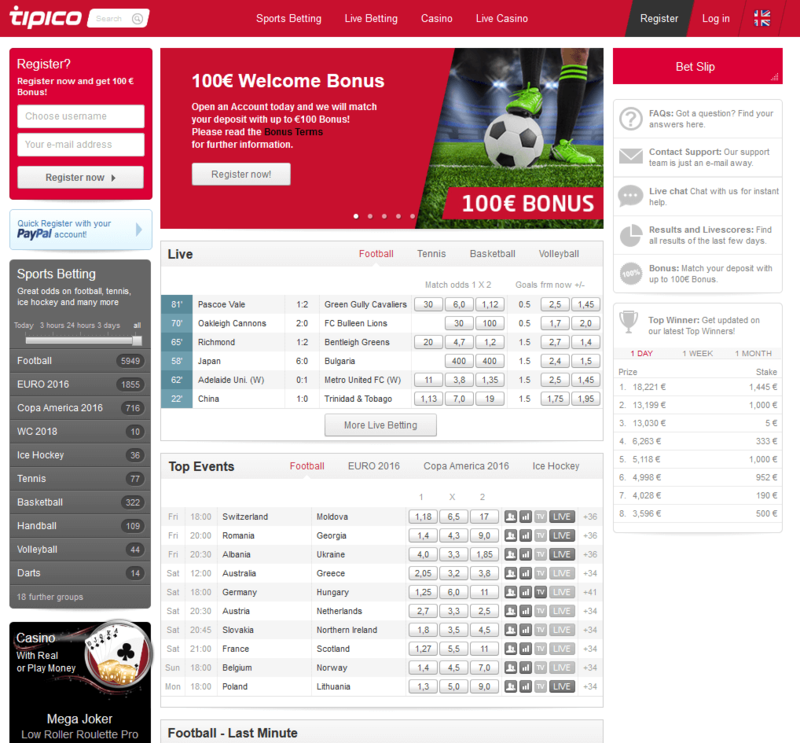 Find more details and information about Tipico in our detailed Tipico Review. We will show you how to register your account, how to get your €100 First Deposit Bonus, which markets are available, and much more. They offer new customers a bonus on their first deposit, up to €100. The minimum deposit in order to qualify for this offer is €10. The deposit amount and the bonus amount combined need to be wagered three times on sports betting before being able to make a withdraw. To claim the the maximum bonus, you will have to bet at least €600 before cashing out. The minimum required odds are 2.0 no matter if you are placing a single bet or a combined bet. The First Deposit Bonus is only available to customers from the following countries: Germany, Austria, the Netherlands, and Sweden. 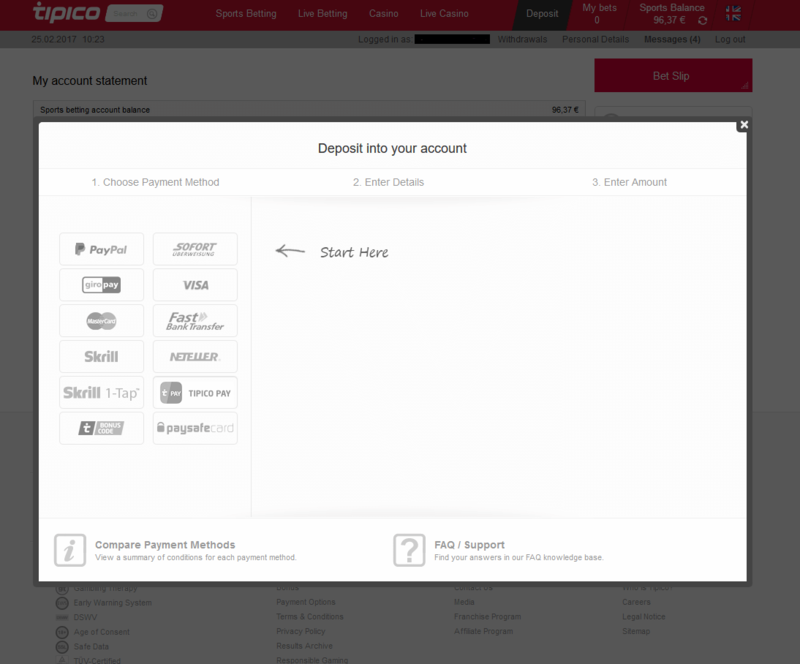 Please be aware that Tipico has recently removed the welcome bonus offer for payments processed using Neteller or Skrill in all countries. Minimum deposit requirement of €10. Skrill and Neteller deposits are not eligble. Turnover requirement of 3x your bonus and deposit amount. You have 90 days to fulfill the turnover requirements. 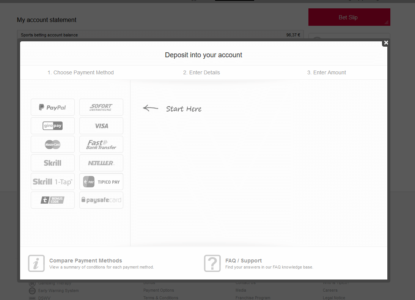 The following step-by-step guide will show you how to easily set up your account within a few minutes and benefit from our great €100 Deposit Bonus. Please make sure to use our sign-up link to start the free registration process. You will then be redirected to their homepage, where you just need to click the ‘Log in’ button in the top right corner. Like many other European sportsbooks, they are focusing on the large European soccer leagues. 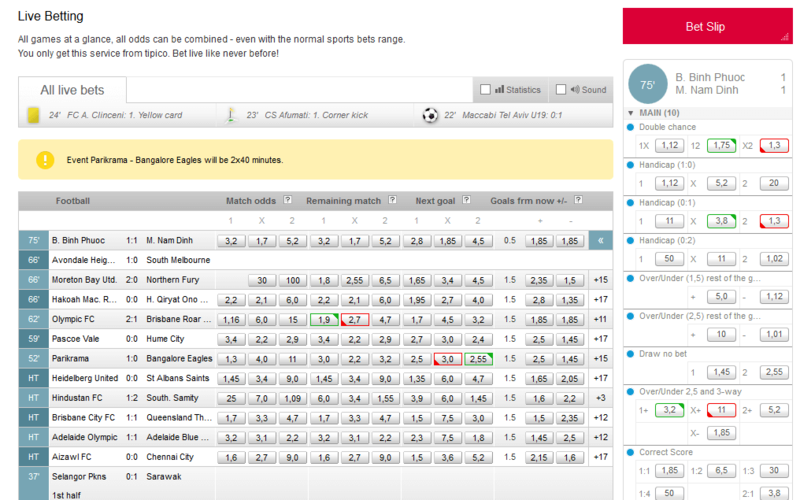 There are more than 20,000 betting markets offered for soccer. However, it is obviously not the only sport offered by Tipico. There are many other betting markets for all major sports like tennis, basketball, ice hockey, and rather new sports like eSports too. When it comes to betting odds, Tipico is more on the average side. However, especially for German bettors, it is one of the best alternatives because they do not charge their customers the 5% tax fee like many of their competitors. This can easily compensate for the slightly lower odds. 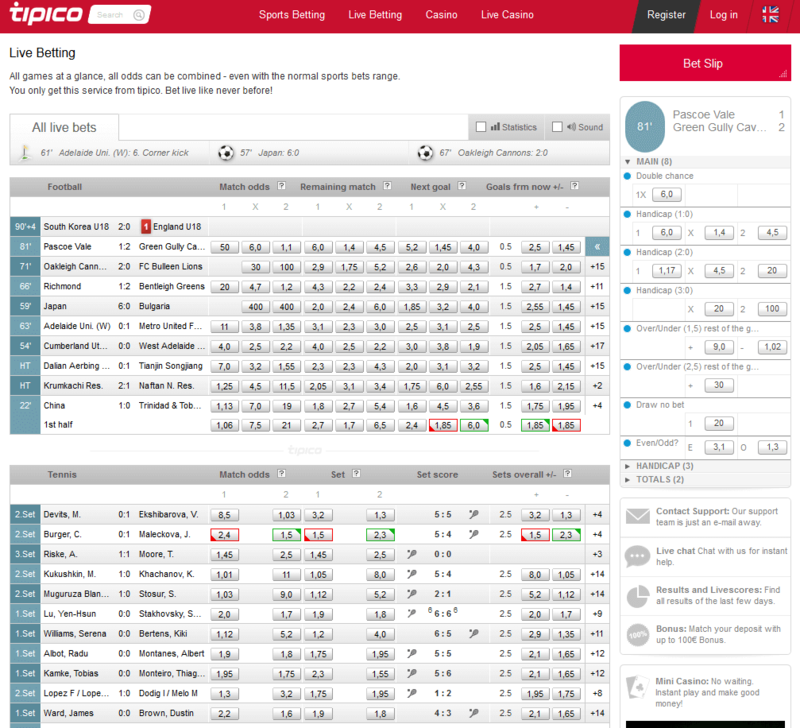 Before you place your bets you should also check our Odds Comparison Page, where we provide an overview of the best odds for different events through different sportsbooks. 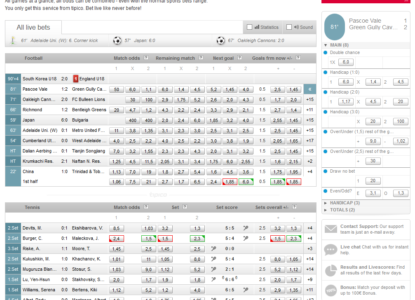 Here you can easily find the most profitable sportsbook to place your bets. Give it a try and see how easy it can be to increase and maximize your winning by just picking the best site to place your bets. 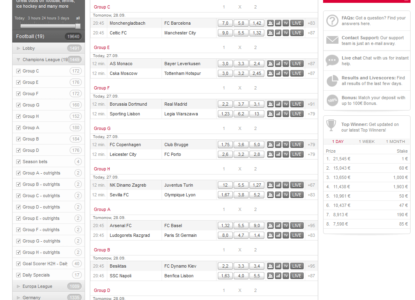 Unfortunately, Tipico does not offer any live streaming on their site yet. There might be some changes in the future, but in the meantime you can check our Sports Live Streaming section, where you will find the best live streaming sportsbooks and some more information about live streaming in general. 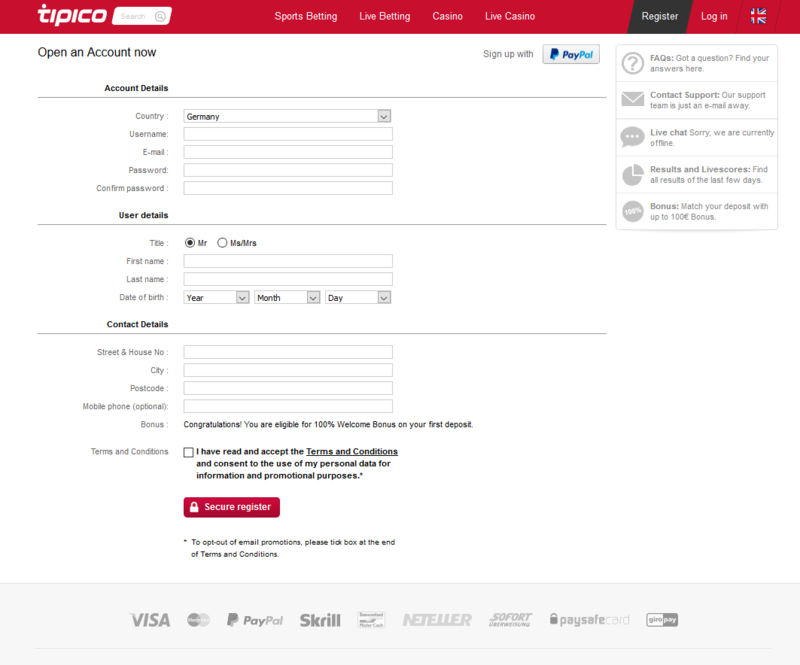 Tipico offers the most important and bigger payment options, so that almost all customers will find a decent method to easily deposit into their sportsbook accounts. The following table gives you a quick overview about the most important payment options and their fees and limits. Tipico does not offer many promotions. They will offer some individual free bets or bonuses to some clients from time to time, but that’s basically all. 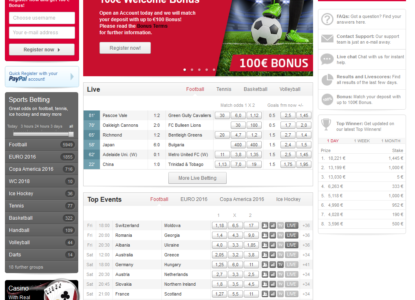 Check our Free Bet and Bonus Offers pages to find more sportsbooks with some great promotions. Tipico is an international sports betting and casino provider based in Saint Julian’s in Malta. The company has several branches in Germany, Austria, Croatia, Gibraltar, and Colombia. Moreover the website Tipico.com is currently operating in Belgium, Denmark, Italy, Malta, Netherlands, and Sweden. Tipico was founded by four German university students on Malta. The company has become highly successful not only in the German-speaking parts of Europe, but also in many other countries. They currently have over 1,100 betting shops in Germany and more that 1,400 all across Europe. While the headquarters for their online branch are situated in Malta, the betting shops and their administration are operated in the Frankfurt main office. They have a sales volume of approximately €1 billion per year and has over 1.27 million active customers on its website. The company has become the biggest private sports betting and gaming operator in Germany. In order to become the biggest sports betting provider in Germany, they had to take several steps to compete with their multiple competitors. The company has initiated several collaborations with amateur football clubs, providing them with football jerseys from popular distributors at a reduced price. They are also involved with several foundations which aim to improve Fair Play and are sponsor to various local sport events. The company is investing in social projects in the sports sector together with its media partner Sky. They have also become a member of the Union of Telecommunication and Media (DVTM) in Germany. In 2012 Tipico became the first sports betting operator with a TÜV-Rheinland certificate. This certificate is proof of the security of customer data shared with Tipico, which has been heavily improved by implementing the new Information Management System (ISMS). Licensing sports betting companies in Germany has become a never-ending story. In 2014 leading European sports betting providers founded the German Sports Betting Association (DSWV) in Berlin. Their main topic is the uncertain legal situation regarding sports betting in Germany. In 2012 Schleswig-Holstein passed a liberal gambling law which enabled online operators to apply for licenses for most games of chance including sports bets, poker, and casino games. Just one year after Schleswig-Holstein passed this law, they decided to withdraw their gambling law after granting about 50 licenses to online operators, Tipico being one of them. Those granted licenses will remain valid for 6 more years. In September, 2014, the Hesse Ministry of the Interior and Sport revealed a list of 20 federal online sports betting licensees, which excluded Tipico. The company decided to sue against that decision. The administrative court of Wiesbaden stopped the licensing process of providing licenses by the Hesse Ministry of the Interior and Sport, allowing Tipico Ltd. to keep their betting shops opened. The private equity company CVC Capital Partners announced they have purchased a majority stake in Tipico. Industry sources were reporting that Deutsche Telekom and private investment group Centerbridge have also shown interest in acquiring them. Although the purchase price remains confidential, industry analysts estimate the value of the sports betting and gaming operator at approximately €1.4 billion. The founders of the company will keep 40% of their shares in Tipico. 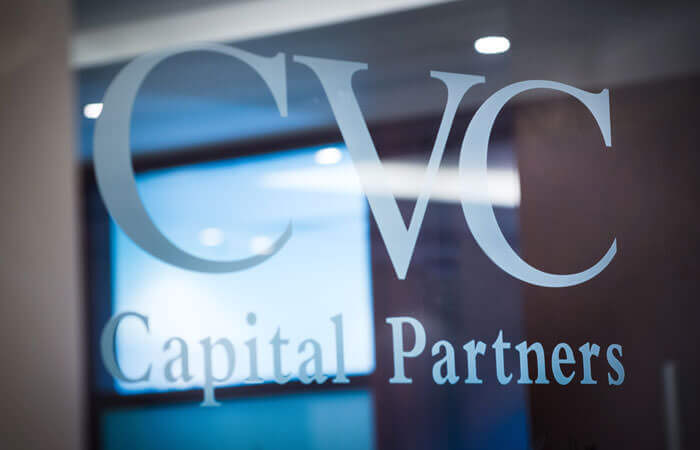 CVC is planning to add new sports to its repertoire and will modernize their betting shops. The finance investor, who also owns Sky Bet, is currently not targeting a fusion between those two brands. Head Office: St. Julian’s, Malta. You can use the mobile app for all your Android and iOS devices. The iOS app can be downloaded from the Apple Play Store. However, it is a bit more complicated with the Android app. The reason for that is Google’s strict policy against gambling and therefore they removed the apps from their store. However, most bigger sites are fully aware of this problem and provide a link to download the app on their sites and so does Tipico. To download the Android app just click the following button and follow the instructions on the Tipico Mobile website. Please note, you will also find several other sources where you can download the android app, but we would highly recommend to not use apps from an unknown source and only use the app from the original app from their homepage. 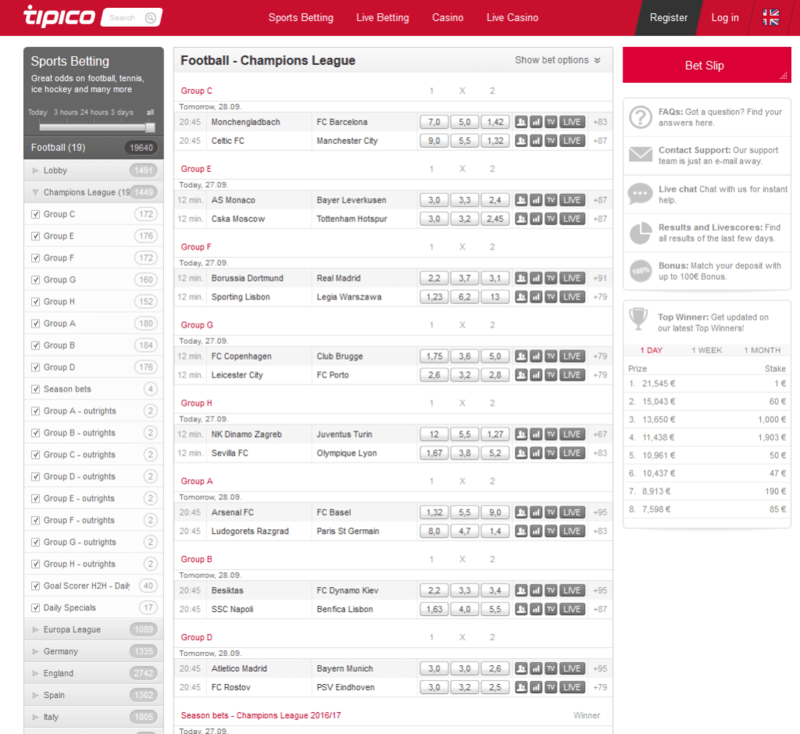 Sports & Leagues: Tipico offers a selection of 16 different sports.